$55.00 Badge for Excellence of Socialist Competition, Ministry of Shipbuilding Industry, Type 3,	circa 1960s-70s. $360.00 Badge for Excellence in Socialist Competition of Automobile Transportation and Road Building of Ukraine, #120, 1960s. $125.00 Badge of an Honored Worker of Seafaring Merchant Fleet, Type 2, #15179, circa 1960s. Late version featuring counter-relief to the reverse. In outstanding condition, with flawless enamel and gilt finish. $125.00 Badge for Excellence in the GUDRP (Dnepr River Main Steamship Agency), 1960s. Excellent condition. $275.00 Badge for Excellence in Socialist Competition, Ministry of the River Fleet of Latvia, 1960s. Very fine to excellent condition. $25.00 Russian Soviet Republic Badge for Winner of the Socialist Competition. Circa 1960s. $20.00 Badge for Excellence in Socialist Competition of RSFSR (Russian Soviet Federative Socialist Republic), circa 1960s- 70s. A very attractive mint marked piece in light metal featuring classic Soviet artwork. In excellent condition. $50.00 Badge for Excellence in Socialist Competition, Sovnarkhoz of Kazakhstan, 1960s. Excellent condition. $85.00 Badge for Excellence in Socialist Competition, Sovnarkhoz of Turkmenistan, 1960s. Excellent condition. To see other Civilian School,Education and Science Badges currently in stock, please visit "Civilian School, Education and Science Badges" in our "Soviet Badges" section. $45.00 Medal (Badge) of Honored Employee of the Communication Equipment Industry of the USSR, pin back version, circa 1980s. A relatively uncommon award made by the Moscow Mint. In excellent condition. $4.00 Shockworker of Communist Labor Badge, 1970s-80s. $20.00 Badge for Excellent Work, Ministry of Culture of the USSR, 1980s. $35.00 Badge for Excellence in Instrument Production, circa 1960s-70s. Very fine to excellent condition. $20.00 Badge for Excellence in Socialist Competition, Ministry of Electronics Industry, circa 1970s. $50.00 Badge for Excellence in Socialist Competition, Ministry of Automobile Industry (Minavtoprom), circa 1970s. In excellent condition. $70.00 Badge of Honored Master of the Ministry of Bread Products, 1956-58. This well-made piece in brass and enamels was issues for only two years. Excellent condition. $35.00 Medal for Excellence in Ministry of Fertilizers of the USSR, mid to late 1980s. Very fine condition. $95.00 Medal of Honored Worker of the Cellulose and Paper Industry of the USSR, circa 1980s. Excellent condition. $45.00 Medal of Distinguished Fish Farmer, circa 1980s. Excellent condition. $6.00 Badge for Shockworker of the Tenth Five Year Plan, 1976 -1981. $6.00 Award document for the badge Shockworker of the Eleventh Five Year Plan. 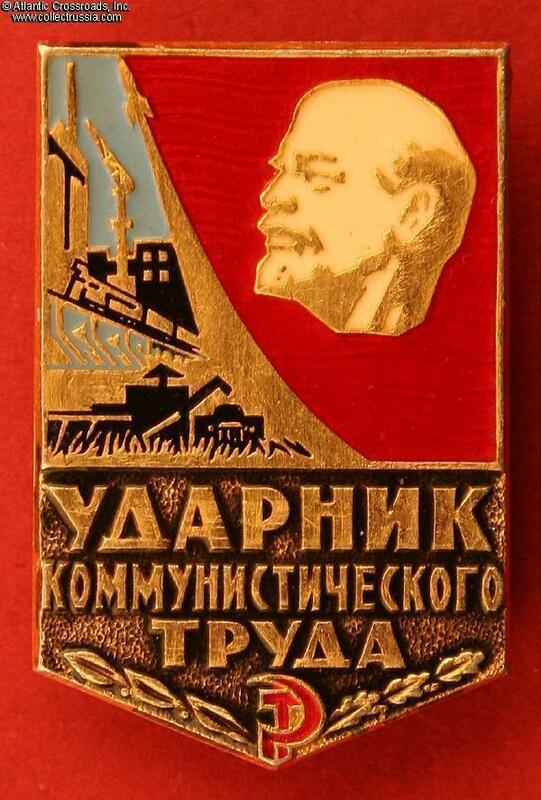 $4.00 Badge for Shockworker of the Twelfth Five Year Plan, 1986- 1990, the last Five Year Plan to run its full course before the end of the USSR. $5.00 Badge for Winner of the Socialist Competition for 1973. $5.00 Badge for winner of the Socialist Competition for 1975. $6.00 Award document for Badge for Winner of the Socialist Competition in 1975. $5.00 Badge for winner of the Socialist Competition for 1977. $5.00 Badge for winner of the Socialist Competition for 1978. $6.00 Award document for Badge for Winner of the Socialist Competition in 1980. $7.00 Chernobyl Nuclear Disaster Clean-Up Medal (officially known as Badge for the Liquidation of the Consequences of the Chernobyl Catastrophe), 1980s. $40.00 Medal for Cultural Support of the Builders of the Baikal-Amur Railway, circa 1970s-80s. $50.00 21st International Dairy Congress in Moscow, participant's medal, 1981. Near mint condition. $25.00 Medal for the Construction of the Main Natural Gas Pipeline Soyuz, late 1970s. In excellent condition. $40.00 Award document for the Soyuz Pipeline Construction Medal, issued in November 1978	to a Bulgarian recipient. $18.00 Small Gold Medal of the "Exhibition of Achievements of the National Economy" in Moscow, 1959 through 1960s. Screwback suspension. $15.00 Small Gold Medal of the "Exhibition of Achievements of the National Economy" in Moscow, circa 1970s-1980s. Pinback suspension. $12.00 Small Silver Medal of the "Exhibition of Achievements of the National Economy" in Moscow, circa 1960s-1980s. $40.00 Medal of a Laureate of the Exhibition of the Economic Achievements of Ukraine, circa 1960s-70s. Excellent condition. $35.00 Medal of the Exhibition of the Economic Achievements of Kazakh Soviet Socialist Republic,	circa 1960s-70s. $40.00 Centenary of the Krengolm Textile Factory in Estonia, commemorative badge, 1957. Very unusual design having Latin text next to the Russian.